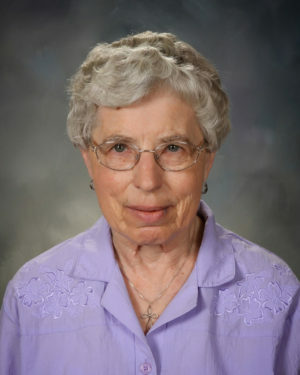 Sister Deanna (Mariel) Randall, BVM died Friday, Feb. 1, 2019, at Caritas Center. Visitation, the Sharing of Memories and Mass of Christian Burial were on Thursday, Feb. 7, 2019, in the Marian Hall Chapel. Burial is in the Mount Carmel Cemetery. Sister Deanna was born on July 6, 1937, in Denver, to Lesley and Margery Pavela Randall. She entered the BVM congregation Sept. 8, 1956, from St. Charles Borromeo Parish, Oklahoma City, Okla. Sister was an elementary teacher at St. Gilbert, Grayslake, Ill.; St. Charles, Holy Trinity and St. Callistus, Chicago; and St. Gregory the Great, Bellerose, N.Y. She served as administrator, director and/or teacher at Oak Park Montessori, Oak Park, Ill.; Cure d’ Ars and Montessori Child Development Center in Denver; Christ the King Montessori, Jackson, Miss. ; and Jonestown Learning Center, Clarksdale, Miss. She was preceded in death by her parents. She is survived by a sister Juanita (Ray) Johnson, Pine, Colo.; a niece Linda Johnson Hendrickson; a nephew Daniel Johnson; and the Sisters of Charity, BVM, with whom she shared life for 62 years.